Skype doesn’t just have to be on your computer. In fact, Skype can be used to replace your conventional means of making a phone call. You can do away with your landline altogether and use one single Skype account across multiple devices, including your home phone. Getting Skype set up with your home phone is easier than you might think and can save plenty of money. So how do you do it? Before you get started with Skype on your home phone, you will need an account, unless you have one already. If not, then getting set up is very simple indeed. All you need to do is head over to Skype’s sign-up page, which can be found here. From there, it is a case of handing over a few details. Skype premium is a paid-for option that comes with Skype. At £3.44 a month, it lets you choose one country with which to have unlimited landline calls or – in the case of the US, Hong Kong, Canada and Singapore -landlines and mobiles. You also get group video calling and group screen-sharing, no adverts and live customer support. Skype Premium is especially helpful if you plan to make a lot of phone calls to one particular country, as signing up to the service allows you unlimited free calls to a single country of your choice. Not everywhere is included, so it’s worth checking this out. One particularly clever Skype premium trick is selecting the country you currently live in for free calls. That way you can call any landline at any time of day for £3.44 a month – a big saving compared to your conventional phone bill. It results in worry-free calls to relatives who might not have access to Skype. Once you have your account set up, then it is time to move on to the next stage: swapping your home phone for a Skype line. This can be done in two different ways, either with an adapter or a specially made Skype phone. Let’s look at both. 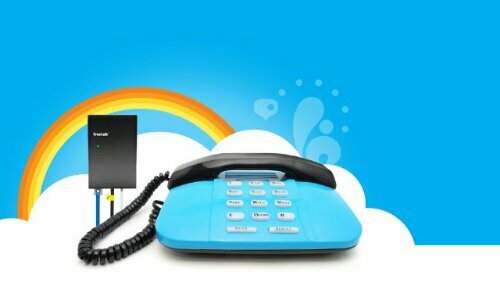 A Skype adapter essentially transforms your normal home phone into a Skype line. This way you don’t need to switch out your current phone, which may have numbers saved. It can also save a bit of cash. You can pick up a Skype adapter here. 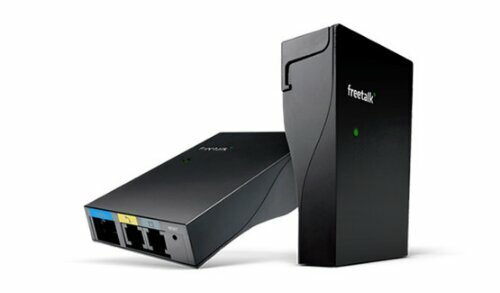 The Freetalk adapter connects to your landline and router, combining both conventional landline calls and Skype. The adapter comes in several different packages, many of which offer bundled minutes and free calls to specific countries. It does require an internet connection to work and a computer to set up, however once you are up and running, the box will sync with your Skype account and should work immediately. The Freetalk box switches between landline and Skype. For some things, say emergency calls, it automatically routes through your landline. Calls are also received in the conventional way. The difference is that the adapter also gives you the option to make free Skype-to-Skype calls, as well as phone calls to landlines through your Skype account. Using a phone specially made for Skype brings several benefits. In most cases, it will link your phone contacts with your Skype contacts, putting them all in one place. 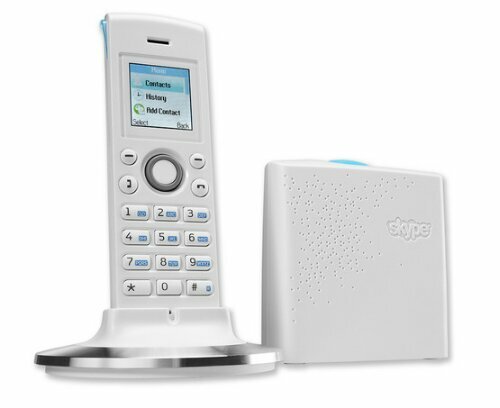 A Skype phone like the RTX Dualphone 3088 will also switch instantly between your landline and Skype. The handset is designed from the ground up with Skype in mind and includes a high-quality speakerphone so you can chat for free over Skype for long periods without having to hold it to your ear. Set-up with any Skype phone is again very straightforward. You will need a broadband connection and a landline subscription to get the most out of the phone’s dual functionality. In most cases, no computer is required, simply connect things up, sign in and you are away. Many Skype phones feature multi-purpose notification lights which will light up when you receive messages through Skype – an added bonus of using a dedicated Skype phone. A lot of the RTX Dualphone handsets can be picked up fairly cheaply from the Skype shop. They can make for a great way to communicate with friends and family at little cost. Send one to your kids, parents or grandparents and then chat away over Skype for as long as you like. And the set-up is so simple that even the least tech savvy should be able to handle it. Follow us on Facebook and Twitter for a chance to win one of our awesome competitions. I joined Beginners Tech as a Technical Journalist in July 2012 and have never looked back. I love tech, gadgets, games and electronics; whether they are retro, current or future concepts. My loving fiancé Sarah has said that when I receive new items for review I’m like a kid in a toy shop – unable to leave it alone for two minutes! Coming from a design background, I am passionate about the design and aesthetics of tech as well as functionality.